Summary: Equipment and supplies are requested to expand and enhance the Turtle Hospital educational programs. The Turtle Hospital has purchased a third ambulance that in addition to being used for sea turtle rescues is on the road and used for education from Key Largo to Key West. The Turtle Hospital located in the heart of the Keys aids in the rescue, rehabilitation, and release of sick and injured sea turtles. An important part of the hospital mission is to educate the public on the importance of sea turtles, their protection, and ocean conservation. The experienced education staff now brings engaging, multimedia programming into Monroe County Schools, Events, State Parks, and Resorts throughout the Keys. These outreach programs are offered to the public free of charge. We have seen over 46,000 people in our off-site outreach programs to date in 2014. This includes local school children as well as guests visiting our islands. 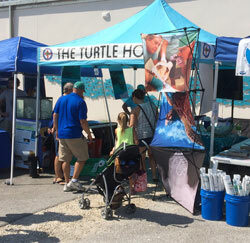 The Sea Turtle Grants Program funded the original printing of an educational brochure for the Turtle Hospital. We would like to obtain 30,000 of these brochures for distribution on our outreach programs. We would like to purchase a pop-up shade for our outdoor outreach programs and a Lifebook (combination laptop and projector) for multi-media presentations at outreach events. Results: The Turtle Hospital purchased educational equipment and materials to expand and enhance the Turtle Hospital's educational programs. An important part of the hospital's mission is to educate the public on the importance of sea turtles, their protection, and conservation. The experienced education staff now brings engaging, multimedia programming into Monroe County Schools, Events, State Parks, and Resorts throughout the Keys. These outreach programs are offered to the public free of charge. We saw over 50,000 people in our off-site outreach programs in 2015. This includes local school children as well as guests visiting our islands. We purchased 30,000 educational brochures for distribution on our outreach programs. We purchased a pop-up shade for our outdoor outreach programs and a Lifebook (combination laptop and projector) for multi-media presentations at outreach events.